Harrying considers Richard III and the four plays of Shakespeare's Henriad-Richard II, Henry IV Part 1, Henry IV Part 2, and Henry V. Berger combines close reading with cultural analysis to show how the language characters speak always says more than the speakers mean to say. Shakespeare's speakers try to say one thing. Their language says other things that often question the speakers' motives or intentions. 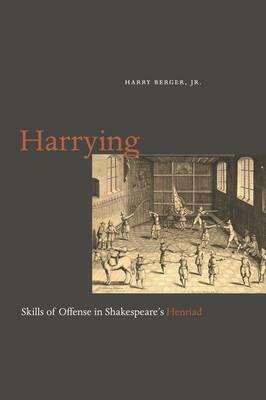 Harrying explores the effect of this linguistic mischief on the representation of all the Henriad's major figures. It centers attention on the portrayal of Falstaff and on the bad faith that darkens the language and performance of Harry, the Prince of Wales who becomes King Henry V.